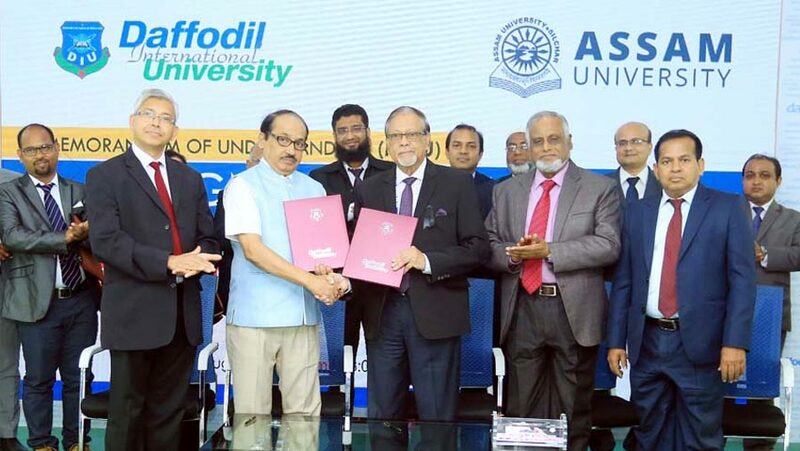 Assam University (Central University) of Assam in India and Daffodil International University (DIU) signed a Memorandum of Understanding (MoU) for establishing and developing a close partnership to promote academic and cultural exchanges between the two institutions through mutual assistance, specially, in the areas of teaching and research. Professor Dr SM Mahabub Ul Haque Majumder, acting Vice-Chancellor of DIU and Professor Dilip Chandra Nath, Vice-Chancellor, Assam University, signed the MoU on behalf of their respective universities at a MoU signing ceremony held on Thursday (Aug 9) at the 71 Milonayoton of DIU. Professor Dr AKM Fazlul haque, acting Registrar, Professor Dr Mostafa Kamal, Dean, Professor A M M Hamidur Rahman, Dean, Faculty of Humanities and Social Science, Prof Dr Masum Iqbal, Dean, Faculty of Business and Entrepreneurship and Prodipto Das, Assistant Professor and Assistatnt Director of IQAC, Assam University, were also present at the ceremony. According to the agreement, from now Assam University, India, and DIU will arrange and develop specific programs of co-operation like: faculty and students program, joint research collaboration, resource sharing, jointly organizing summer and winter camp. DIU and Assam University will set up a 'Cooperation Hub' to each other's campus with a view of facilitating regular cooperative plans, visits, research initiatives, etc.